What exactly is a tablescape? Tablescapes go beyond a mere centerpiece; they are artistic arrangements of various articles on a table. But what does that mean, exactly, you may ask? With a centerpiece, there is normally just one item in the center of the table. Your centerpiece may be a tall vase filled with fresh flowers, a basket overflowing with fresh fruit or seasonal foliage, a vintage lantern, or a candle arrangement. A tablescape takes the concept of centerpieces one step further. Instead of just one single item in the center of your table, a tablescape usually takes up about one third of your tabletop space (any more, and you may not have enough room for the place settings and glassware for your guests). Using fresh herbs as a central theme. For this kind of tablescape idea, take a look at a beautiful example of what one person wrought using the woody perennial herb rosemary as a theme for an autumn seasonal tablescape. Blending the warmth of this aromatic herb with its spiky, fragrant leaves together with soft tealight candles in beautiful glass votives, fresh flowers in grey clay pots, classic white plates, and natural linen napkins makes a table to remember. This seems quite apropos, since during ancient times rosemary was universally used as a symbol of remembrance. Place a few sprigs of fresh rosemary along with a fresh flower or other foliage in this sturdy buxom bud vase to add height to the center of your tablescape. Incorporating seasonal fruit into your tablescape. When you have a summertime bash and lots of colorful fruit is in season, it can be a great idea to integrate some fruit into your tablescape. Check out how one hostess took advantage of oranges to add a pop of color to her bold Moroccan-themed tablescape. This is a great, low cost way to add richness, texture, and color to your table. A beautiful bowl full of luscious, ripe fruit makes a flavorful addition to any tablescape. If you are designing a tablescape for a girl’s gathering such as a baby shower, especially if the baby’s gender hasn’t been revealed yet, decorating in alternating pink and blue is a fun way to bring pastel prettiness to your table. Try mixing these two colors using a mixture of flowers like carnations and roses, add a pop of white for freshness, and present in a beautiful fairy tale vase in the center of the table, and again in individual mason jars tied with ribbons. Displayed atop a white lace or versatile macramé table runner with a few well-placed antique candlesticks will help add depth and texture to your table and render an enchanting tablescape idea. 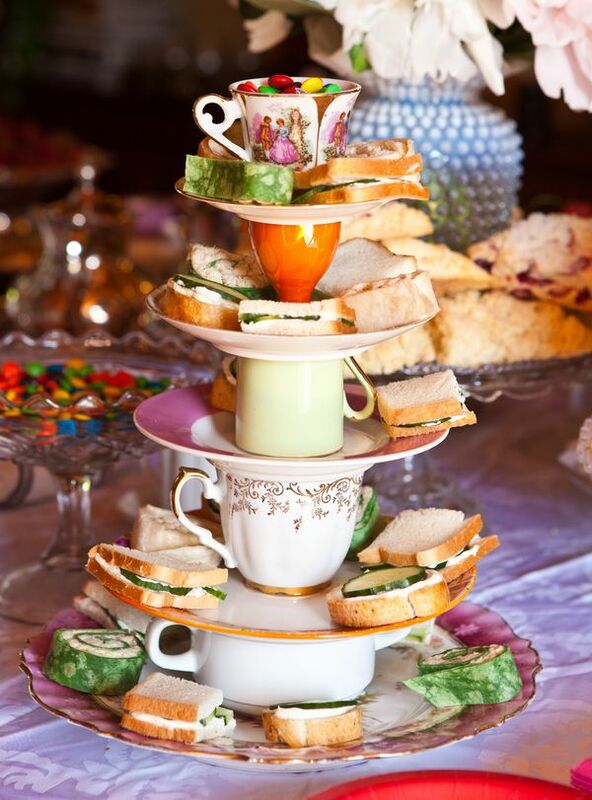 For an elegant tea party, a pretty vintage teapot or oversized teacup full of vibrantly colored flowers can be placed in the center of the table. Adding colorful teacups and saucers (matching or mismatched both work well) flowing down the length of the table on either side of the teapot will also add to the visual appeal. If your table is small, going vertical could be the way to go, with a multi-tiered approach that is both beautiful and functional. Add a touch of fun and interest with flowering teas. Your guests will enjoy watching their teacup come alive as their individual tea pods flower in hot water. Sometimes your food IS your tablescape! If you’re hosting a buffet, there are an untold number of ways to set it up, but in this instance the food is the main attraction. Check out these 25 buffet table decorating ideas for even more tablescaping ideas. It offers variety of creative and beautiful ways to show off your food, from American flags and red, white and blue candy for a Memorial Day, 4th of July, or Labor Day back yard barbecue to using greenery to highlight a sumptuous breakfast buffet. It’s a good idea to have a beginning point well marked, perhaps with a special decorative lantern, so your guests know which end of the table to begin loading up their plates. Whether you are hosting an elegant dinner party indoors or a down home, relaxed back yard barbecue, it’s always fun to decorate your table in new and interesting ways. Although the food is the main course, the tablescape can be a wonderful “appetizer” preparing your guests to expect the best, enhancing the look and overall feel of the setting, and helping create the ambience that makes you and your guests able to relax and enjoy breaking bread and spending time together.